Bury Markets - Bury Market welcomes its 1,000th coach of the year! Bury Market welcomes its 1,000th coach of the year! The 1,000th coach came from Barnsley, South Yorkshire and is home to Gee Vee Travel, a tour operator which frequently schedules coach trips to Bury Market. Gee Vee is a family-run business and has been running tours and day excursions since 1984. The driver of the Coach was given a surprise on the day and presented with a bottle of champagne. 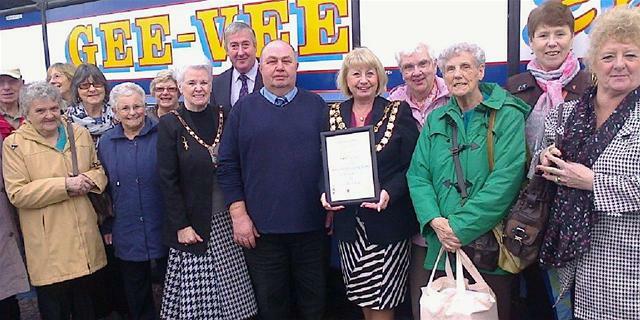 Gee Vee were then contacted and invited to return to the Market to collect their certificate. When Gee Vee next came the Deputy Mayor of Bury, Councillor Sharon Briggs, presented driver Melvin Clayton with a certificate commemorating this milestone, and all his passengers received a free Bury Market shopping bag. "Gee Vee Travel have been big supporters of the market so this award is rightly deserved. We hope our association with them continues for many years to come." Pictured: One thousand reasons to visit Bury Market - Melvin Clayton receives the certificate on behalf of Gee Vee Travel from the Deputy Mayor of Bury, Cllr Sharon Briggs.